sheep's nose and old maids winter. the forgotten fruits. Golden Russet, Fox Apple, Hughe’s Crab, Bramley’s Seedling, Knobbed Russet or Old Maid’s Winter, Black Oxford, Anas Reinette, Roxbury Russett, Sheep’s Nose, Lady Apple, Esopus Spitzenburg, Riene des Reinettes, Blue Permain, Cox’s Orange Pippin, Holstein, Ashmead’s Kernal, Orlean’s Reinette, Maiden’s Blush, Wolf River, Pitmaston Pineapple, Snow, Sops Of Wine, Dolgo Crab and Hidden Rose, these are but a few of The heirloom apple varieties that Fruiter Maggie Nesciur collected on her four day Journey to apple farms from New York to New Jersey to Vermont, New Hampshire and back. Last weekend at The New Amsterdam market under the Brooklyn Bridge she set up a tasting table with all these forgotten heirlooms dating back to the 1700 and 1800’s. There were audible gasps when people saw the Knobbed Russet or Old Maid’s Winter. It is an extremely ugly apple, unlike anything we are used to in this very homogenous world. It looks more like a deformed potato than an apple, but like most of these beauties, the surprise lies inside. The taste is phenomenal. Some were sweet and crunchy with a hint of strawberries, while others tasted of pineapple and lemon and spice. They have something in common with a great wine or an amazing cheese as they are layered with complex textures and subtle flavors. Apples are not native to this country. The apple’s history traces back to the Middle East. The apple’s roots lie in the remote villages and forests of Kazakhstan dating back thousands of years. There were apples of many colors and varieties in Kazakhstan. Like spices, traveler’s and trader’s on The Silk Road most likely picked up apples on their journey discarding seeds along the way that then hybridized freely with native crab apples to produce millions of different apple trees in Europe and Asia. When European settlers came to America, they bought with them the apple seeds and branches from their favorite apple trees. These seeds were planted and the branches grafted. Planting apple seeds does not guarantee you great apples. Many apples planted from seed end up bitter or tasteless. The apple story is far more complicated than it seems. Planting a seed from an heirloom or other variety will not guarantee you that apple by any means. You might get something totally different. Settlers for sure planted from seed, but more than likely grafted the apples with the best taste to a rootstock that acts as a host for the graft. The apples that tasted great and did well here in this climate were encouraged and thus became popular American varieties and propagation of those varieties was encouraged. As they planted the trees, the apples grew and wild animals spread the seeds farther into the wild creating new and wild varieties. As the settlers cleared farther and farther out they came to realize the wild apple had already preceded them. There are many wild or feral varieties of apples now growing in the forests and fields and woods of this country. Wild apples are different from heirlooms, they are generally quite small in size, but they can be just as tasty. We gather our wild apples in Upstate New York and use them to make applesauce and cider. They are not pretty in the least, but they are quite good! Today, heirloom varieties make up only ten percent of total apple variety in the mass consumption of apples, the other ninety percent is represented by relatively few varieties, the kinds we commonly see in grocery stores, perfect and unflawed, sometimes a little mealy, and perhaps a little boring. The many heirloom varieties available to settlers were used for distinctly different purposes. Some were good for cider and fermentation, some for winter storing while others were good for sauce or pie or just plain eating. I have read that apples were mainly used for hard cider in the early days of settlement, because it was much easier to make than corn liquor. During prohibition it was the Women's Movement that turned image of the apple around from liquor to pie. Thus creating the image, as American as apple pie. The flavors of heirlooms are so unique and interesting. 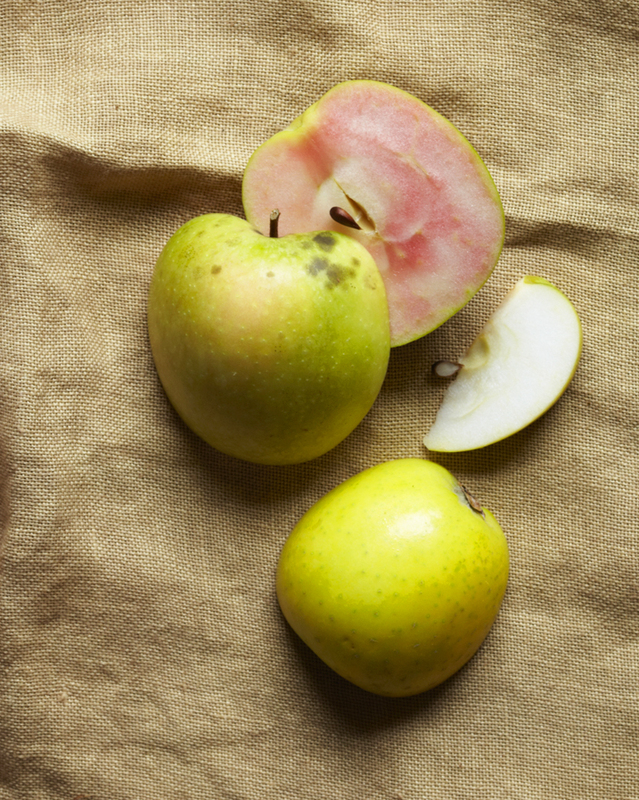 The next time you are at a farmers market, see if you can find some heirloom apples. Seek them out. Supply and demand is one sure way to keep these forgotten fruits alive. Come out to The New Amsterdam Market this weekend for the hard cider revival and get a taste history.